The beast that is Daytona Supercross certainly lived up to it's reputation of being the toughest SX race in the world. The recent heavy rainfall in the "Sunshine State" made for some inconsistent soil coming in. Luckily the weather was perfect on race day, but that did not prevent the track from being very rutted and soft. It's not often that you see top riders in the world look so out of sorts so many times like last weekend. Nearly every rider in the field found themselves on the ground at least once, including the Rockstar Energy Racing Duo of Ivan Tedesco and Cole Thompson. Ivan Tedesco definitely had a subpar day that he would like to erase from his memory banks. While trying to deal with the treacherous conditions, he went down hard on his left side. He banged his head and ended up with a very swollen, black and blue finger in the process. It was decided prior to the start of the heat races that Tedesco would sit this one out. Ivan Tedesco: "Rough Weekend for me. Went down in the final practice and hit my head and smashed my finger. Decided not to race because I was feeling a little foggy. I hope to rebound next week in Detroit." Cole Thompson was having what appeared to be his best day thus far in the 2014 SX season. He had decent times all day in practice and looked much more aggressive on the bike. Something he had been lacking a bit in the previous couple of races. He then put together a stellar ride in his qualifier for a top 3 finish. Things we're looking very good going into the main with a good gate pick. Then he was bitten by the crash bug rounding the first turn and was run over. He got up not just in last, but several seconds behind the next rider in front of him. Cole was really beat up from the fall. It was very commendable for him to put in the effort that he did. He may have only been able to pick off 9 riders to eventually get 13th, but he never quit. After the race he was bruised, battered and bleeding but will live to fight another day. 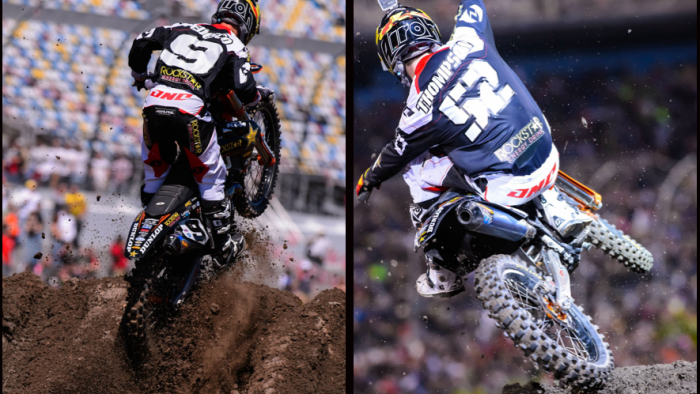 Cole Thompson: "Daytona was an up and down night for me. I felt good in my heat race and finished 3rd. The main event I crashed in the first turn and had to work my way back up from last to finish 13th. I caught up to a pack of riders at the end but ran short on laps. Definitely not where I want to be finishing, I just need to keep working hard during the week and make it all come together next weekend." The team now heads to a venue that that hasn't held a Supercross race for several years in Detroit. Tedesco will get an x-ray on his smashed finger but will suit up and race regardless of the prognosis. Thompson will heal up and carry over the positives from Daytona into Ford Field in Michigan.